This is the true story behind the making of a television legend. There have been many books written about Star Trek, but never with the unprecedented access, insight and candor of authors Mark A. Altman and Edward Gross. Having covered the franchise for over three decades, they've assembled the ultimate guide to a television classic. The Fifty-Year Mission: Volume Two is an incisive, no-holds-barred oral history telling the story of post-Original Series Star Trek, told exclusively by the people who were there, in their own words—sharing the inside scoop they've never told before—unveiling the oftentimes shocking true story of the history of Star Trek and chronicling the trials, tribulations—and tribbles—that have remained deeply buried secrets... until now. 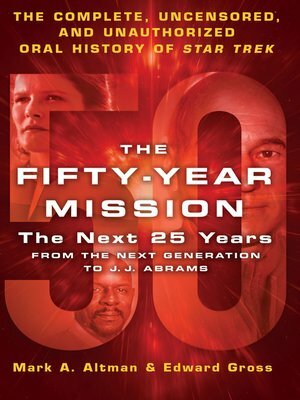 The Fifty-Year Mission: Volume Two includes the voices of hundreds television and film executives, programmers, writers, creators, and cast, who span from the beloved The Next Generation and subsequent films through its spin-offs: Deep Space Nine, Voyager, and Enterprise, as well J.J. Abrams' reimagined film series.